One of the most common questions we get is “What kind of bacteria do you use? Will it make me sick? 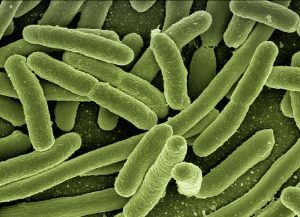 !” Here we’ve added a brief description of the 2 strains of bacteria that we use for sterilizer monitoring, and some interesting facts on each. Spoiler alert: These germs won’t make you sick. Geobacillus stearothermophilus was first discovered in 1920, and was originally classified as a member of the genus Bacillus. Until the discovery of archaebacteria in hot springs, G. stearothermophilus was the most heat-resistant organism known to man. It is classified as a thermophile (heat-loving bacterium) and will grow within a temperature range of 30-75 degrees Celsius. It has been observed to have to survived temperatures as high as 130 degrees C, making it an ideal specimen for verifying proper sterilization temperatures in steam autoclaves. G. stearothermophilus is widely distributed in soil, hot springs, ocean sediment, and is a cause of spoilage in food products. It has not been observed to be pathogenic to any host – which makes it a safe option for sterilizer monitoring! We use G. stearothermophilus to test steam and chemical vapor sterilizers. The majority of Bacillus atrophaeus cultures that we use today are from a lineage of B. atrophaeus that originated at a United States Army Medical Command installation located in Frederick, Maryland in the 1950s. The US military used B. atrophaeus as a surrogate for anthrax, as it is non-pathogenic while still being similar to the bacterium Bacillus anthracis for study. The endospores of B. atrophaeus are extremely resistant to stresses, such as chemicals (they can even survive 95% EtOH). We use B. atrophaeus to test dry heat and ethylene oxide sterilizers. DONK P.J. : A highly resistant thermophilic organism” Journal of Bacteriology 1920; 5, 373-374. Nazina, T.N. ; Tourova, T.P. ; Poltaraus, A.B. ; Novikova, E.V. ; Grigoryan, A.A.; Ivanova, A.E. ; Lysenko, A.M.; Petrunyaka, V.V. ; Osipov, G.A. ; Belyaev, S.S.; Ivanov, M.V. Taxonomic study of aerobic thermophilic bacilli. Int. J. Syst. Evol. Microbiol. 2001, 51, 433-446. Gibbons, Henry; et al. (25 Mar 2011). “Genomic signatures of strain selection and enhancement in Bacillus atrophaeus var. globigii, a historical biowarfare simulant”. PLoS ONE. 6 (3): e17836. doi:10.1371/journal.pone.0017836. PMC 3064580 Freely accessible. PMID 21464989.